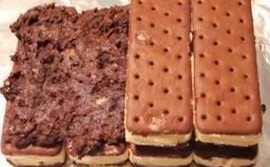 ARRANGE 4 ice cream sandwiches, side-by-side, on 24-inch-long piece of foil; cover with half the COOL WHIP mixture. Repeat layers. Top with remaining sandwiches. Frost with remaining COOL WHIP; press remaining cookies into top and sides of dessert. Wrap loosely with foil.